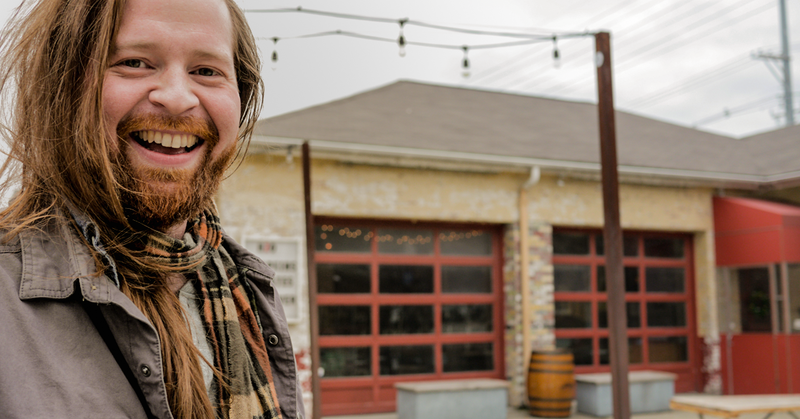 Meet Jeremy Salmon, one of our friends from Louisville, Kentucky’s Garage Bar. If that name sounds familiar, it’s because he was announced as the NuLuDays Holiday Cocktail Challenge winner – two years in a row. Garage Bar is housed in a former auto service garage in downtown Louisville’s NuLu neighborhood. A nod to its roots as a historic saloon, the casual spot serves up draft and bottled craft beers, wine, seasonal cocktails and Kentucky Bourbons. I’ve been at Garage for almost 4 years. What do you think makes Garage Bar special? Garage is a place where any person can feel welcome and control their own experience. We offer some of the finest spirits and craft beers in the industry, as well as excellently crafted cocktails. However, we also offer a casual atmosphere for people that just want to relax on in our AstroTurf beer garden and take in the downtown air over a game of ping pong. Come as you are or come decked out for a wedding—either way, we’ll have you covered. Do you have a favorite beverage and food pairing? I’d say that our best combination is a sampling of our bourbon offerings paired with our chef’s country ham bar tasting platter. I think my passion to work behind a bar was cultivated by my love for people. I love meeting new people, interacting with the public and knowing that every individual feels like they are in a place that they belong. Anyone can buy drinks and enjoy them at home, but people come to a bar for the community and the sense of belonging. I like facilitating these things for everyday folks. The people. I have developed some of the strongest bonds with people that just wanted me to pour them a drink. Before you know it, you’re having Thanksgiving dinner with them and their family or helping them move into a new home. Are there any trends you’ve noticed throughout the years? I’d say that I’ve seen people shift to trying things they may not have tried before. For some, that means a crafted bar-specific cocktail instead of their go-to Bourbon & Coke. For others, it means kicking back with their first PBR even though they usually go for a more upscale option. How do you typically drink your Four Roses Bourbon? In a glass by itself. What inspired your NuLuDays Holiday Cocktail Challenge winning cocktail “The Clark Griswold”? When I think of a themed cocktail, I try to choose flavors that convey the same emotions that the involved theme conveys. For this cocktail, the theme was obviously the winter holidays. I think of all the emotions that come with that and I try to choose flavors that evoke those same emotions when they are tasted. Gingerbread, port wine, spiced pears and the classic ingredients of a Manhattan all combine in “The Clark Griswold” to call to mind family, food and tradition. So, what cocktail will you be making for us today? Today’s cocktail is a winter warmer. It’s a twist on a classic “Hot Buttered Rum.” In my version, I’ll use Four Roses Bourbon in place of the rum and Kentucky Sorghum in place of the brown sugar. 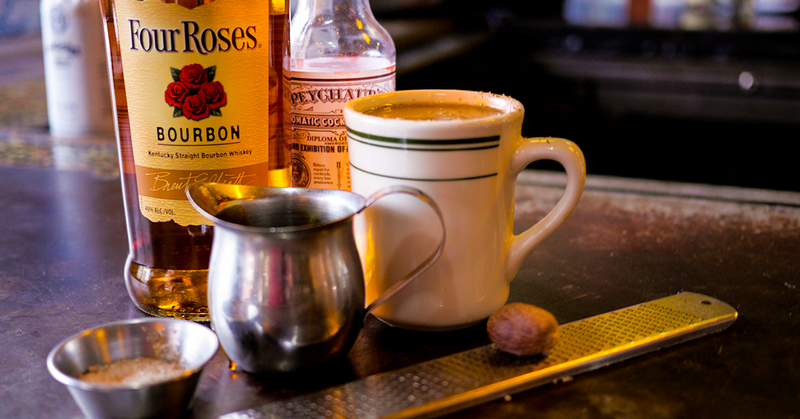 Add a few dashes of Peychaud’s® bitters and a little cinnamon and nutmeg, and you’ve got a nostalgic combination for those cold winter nights. In a mug, mix butter, pure Kentucky sorghum, Peychaud’s® Bitters and cinnamon/sugar. Add Four Roses Bourbon and pour hot water over all ingredients, stirring until fully combined. Grate nutmeg to garnish. If you could make a cocktail for anyone, who would it be? Eddie Vedder, activist and lead singer of Pearl Jam. Is there anything you’d like to toast to? I’d like to toast to the growing Bourbon industry and all the people worldwide who are falling in love every single day with our local and loved Kentucky spirit.